St. Louis Public Radio’s Shahla Farzan traveled to Pocahontas, Illinois to meet the rare American mulefoot hog and the farmers trying to save them. 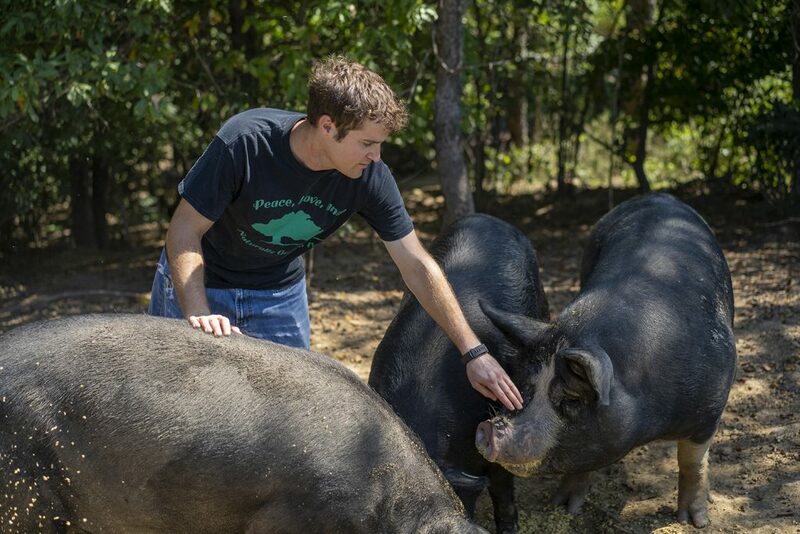 “The reason why this hog is going extinct is people aren’t eating them anymore,” Josh Davis explains, loading buckets of fermented grain into a wagon. He thumps the buckets together and whistles, as his herd of “beautiful flowers” emerges from the trees. The 500-pound hogs roam 12 acres of forest and pasture at Green Finned Hippy Farm, a small organic farm about forty miles northeast of St. Louis. The American mulefoot hog doesn’t look like your typical pink pig — it’s charcoal black with a solid hoof, like a mule. Jeannette Beranger of the Livestock Conservancy says the mulefoot’s “rough and tumble” nature made it particularly attractive to farmers in the Midwest. 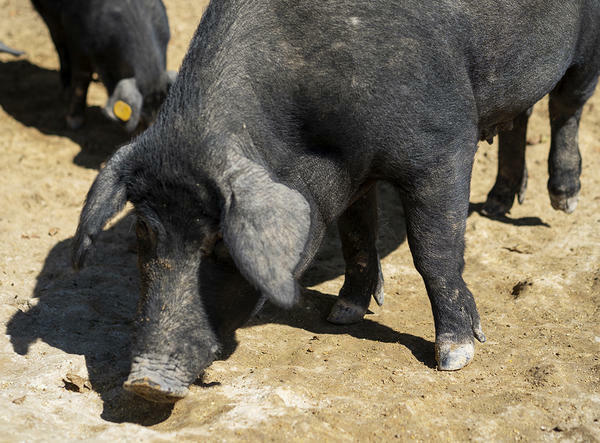 The mulefoot hog started falling out of fashion after World War II, with the rise of commercial agriculture operations that favored a few fast-growing breeds suited to confinement. Missouri farmer R.M. 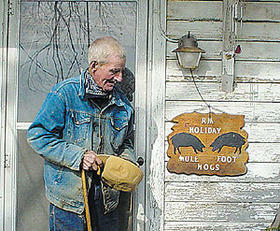 Holliday saved the breed from near-extinction in 1964, when he gathered the few remaining mulefoot hogs in the U.S. and established a conservation herd at his farm in Louisiana, Missouri, about 90 miles northwest of St. Louis. In Illinois, the Davises didn’t need much convincing to get their own herd started. It hasn’t been easy, however, to persuade their fellow farmers to take the risk. For some, the problem is the bottom line: the hogs have smaller litter sizes and take about two months longer to mature than a commercial hog. Although there are several farmers in Missouri raising American mulefoot hogs, including at Littrell Farms in Green City and Crystal Creek Farm in Ash Grove, the Davises are the only registered mulefoot breeders in Illinois. In the end, she said, it comes down to economics. In order to keep the American mulefoot hog from disappearing, they have to put back on the dinner table. Over the past year, the Davises have developed a small but loyal following of local chefs, including Rob Connoley, who owns Squatter’s Cafe in St. Louis. Connoley seeks out local farmers and ranchers in an effort to buy ethically-raised goods with interesting flavors. Connoley pulls a mulefoot hog loin from a chest freezer and points to the thick layer of fat surrounding it. That fat gives the meat a unique flavor that he’s willing to pay a little extra for. 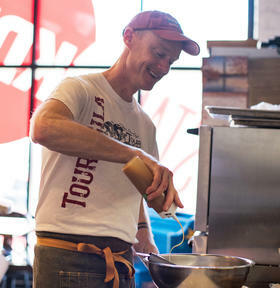 Connoley uses the mulefoot meat in just about everything, including a Mexican mole made with local pawpaw fruit and their best-selling pork apple breakfast hash. He also renders gallons of “beautiful, creamy white lard” from the American mulefoot meat, which he uses in a variety of meat dishes. Taste aside, he said the ethics of the mulefoot meat are the single most important factor to him. Next post: Ask The Newsroom: In Deciding On Judge Candidates, Does Party Affiliation Matter?